The Saarloos Wolfdog is a dog breed surrounded by confusion. A big part of this confusion comes from the breed’s wolf-like looks and heritage. The Saarloos Wolfdog originated by breeding a dog with a wolf, though the initial pairing took place nearly a century ago. 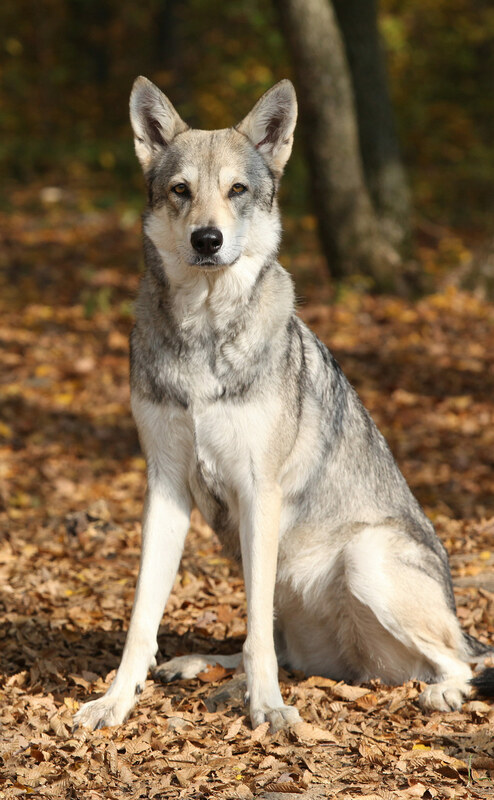 Today, the Saarloos Wolfdog needs and deserves to be considered a dog breed like any other, with unique personality and temperament traits and needs. 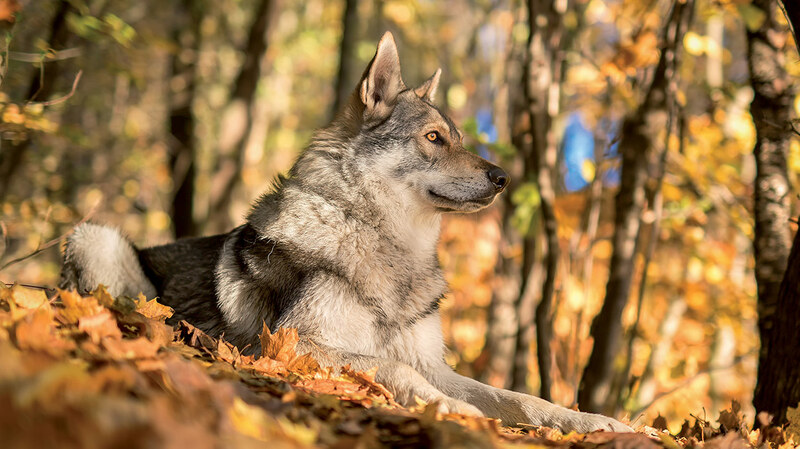 In this article, we will take a comprehensive look at the Saarloos Wolfdog breed so you can decide if this is the right pet for you! Many so-named “designer dogs” get their start in life through the very best of intentions. In fact, the very first designer, or hybrid, dog breed to reach widespread recognition was the product of a single breeder’s attempt to create a hypoallergenic seeing eye dog for a blind woman whose husband was highly allergic to pet dander! There can hardly be a more noble cause than this. In some cases, breeders will deliberately crossbreed a purebred dog species to reduce the incidence of genetically-transmitted health issues. This can occur when an already narrow genetic line becomes narrower as breeders increasingly select breeding pairs on the basis of particular traits: floppy ears, sloping backs, a certain coat color and so forth. Happily, subsequent crossbreeding can work to strengthen the genetic line as well as the health of the dog. In some cases, it can even bring other desirable traits back into the dog that have been lost due to a previously narrow breeding focus. Of course, this can also create a situation where desirable dog traits are bred out of the new hybrid dog breed. This is exactly what happened to the Saarloos Wolfdog, as we are about to discover in the sections to follow! The Saarloos Wolfdog takes its name from its creator, Leendert Saarloos. Saarloos himself was a breeder of German Shepherd dogs. Like many purebreed dog breeders, Saarloos wanted to leave his mark while improving the GSD breed. Specifically, he wanted to add more strength and endurance to his GSD breeding line to create a stock of working police dogs. To do this, Saarloos decided to crossbreed his German Shepherd breeding stock with a purebred wolf. How did Saarloos acquire a wolf with which to conduct his experiment? Well, keep in mind this happened in the early 20th century. He found a local zoo willing to loan him a female adult wolf he named Fleur. He bred this wolf with one of his prize GSDs, a dog named Gerard. Unfortunately for Saarloos, while these puppies did have more strength than a purebred German Shepherd, they lacked the drive and ambition to attack. This result ended Saarloos’ attempts to produce a stellar police dog. But he did discover, completely by accident, that his new “Dutch Wolfdogs” made excellent guide dogs for the blind! He switched course and launched his Dutch Guide Dog Training Centre instead. Saarloos’s Dutch Wolfdogs – now renamed the “Saarloos Wolfdog” (sometimes called the “Saarloos Wolfhound”) in his honor – were formally recognized as a new dog breed in 1957, 6 years after Saarloos himself passed on. While nearly everyone today knows that the modern dog, Canis lupus familiaris, is descended from the ancient wolf, Canis lupus lupus, few people know how or when the companion animal we call the “dog” actually got its start. Researchers think this might have occurred as far back as 27,000 years ago. Experts also believe the original wolf ancestor at the head of the dog lineage is now extinct, although scientists still have plenty more questions to investigate. What biologists do know is that the wolf has been with us for at least half a million years, although the earliest wolf breeds (Pleistocene American wolf, dire wolf) have long since gone extinct as the line itself moved forward. Today, the wolf continues to play an important role in wild settings. Wolf-dog hybrids do exist, but it has been many decades since Leendert Saarloos first crossed a wolf with a German Shepherd. Today’s Saarloos Wolfdogs are dogs like any other. The German Shepherd dog itself got its start just a few decades before Leendert Saarloos began crossing wolves with his GSD breeding stock. Today, the GSD is known for being highly intelligent, with a strong background as a working dog. These dogs also make excellent seeing eye dogs. They are heavily relied upon in police, military, and civilian working dog positions, including as therapy and service dogs. What Are Saarloos Wolfdogs Like? In many ways, it makes sense that Leendert Saarloos initially believed that crossing a wild wolf with a German Shepherd would produce the highest caliber of guard dog – a first-rate police dog that would create ongoing demand. What he actually got was very different, however, and this has contributed to widespread misunderstanding about the breed that bears his name. Any dog breed with the word “wolf” in it is bound to instill fear or hesitation on the part of many animal lovers today. But the Saarloos Wolfdog is wolflike only in appearance! This dog is a dog in every way – one who takes easily to training (although reinforcement is key), has a strong desire to please, and a deep need to be a valued member of a group. No reputable breeder today would recommend the Saarloos Wolfdog as a guard dog. They are too skittish around strangers to be reliable at guarding work. How Big Is A Saarloos Wolfdog? A Saarloos Wolfdog is sizeable at maturity but does not mature quickly. An adult male will stand anywhere from 25 to 30 inches (65 to 75 cm). An adult female will stand anywhere from 23 to 28 inches (60 to 70 cm). Females will weigh from 66 to 77 pounds (30 to 35 kg) and males will weigh from 79 to 90 pounds (36 to 41 kg) at maturity. What Is The Saarloos Wolfdog Really Like? Most people who have never seen a Saarloos Wolfdog are instantly struck by the wolf-like nature of this dog breed’s appearance. Not only does this dog bear the facial appearance of a wolf, but also in its coat, body, and gait, the Saarloos Wolfdog can give the appearance of a wolf loping along. The Saarloos Wolfdog is tall and rangy – longer than it is high. In winter, there may be a ruff of fur present around the neck. Coat colors can vary from a white Saarloos Wolfdog to a cream, grey, or brown-black coat color. Does The Saarloos Wolfdog Have A Good Temperament? The Saarloos Wolfdog, like all dog breeds, has its own characteristic temperament and behavior. One of this breed’s noted quirks is a natural reservation around strangers. But rather than attack, the Saarloos Wolfdog tends to flee when it sees someone it doesn’t know. Even if your Saarloos Wolfdog is very outgoing and exuberant inside of your family unit, it is unlikely your dog will ever lose the overwhelming desire to hide when strangers are present. The Saarloos Wolfdog temperament is highly intelligent and independent-seeming, but can suffer greatly from separation anxiety and loneliness. Grooming a Saarloos Wolfdog is a relatively easy task. The wolf-like coat is waterproof with a thick, insulating under-coat. Brushing once or twice per week year-round, and more frequently during the seasonal coat shedding period, will keep your dog’s coat healthy. Saarloos Wolfdogs have certain known genetic health issues like every other dog breed. However, with appropriate diet, exercise, enrichment, and preventative care, your Saarloos Wolfdog can live 15 or more years. Degenerative Myelopthy is raised in connection with this breed. This degenerative disease strikes the spinal cord. It usually begins in mid-to-late life, causing eventual inability to walk. PRA is another disease to be aware of that causes the retina to gradually deteriorate until the dog goes blind. It happens in both eyes and isn’t painful, and fortunately there is a DNA test that the parents can have to ensure that puppies’ don’t get it. Hereditary Cataracts are also a problem. The Saarloos Wolfdog is known to suffer more from cataracts than most dog breeds. This condition is treatable with medication or surgery. There is also the potential for Pituitary Dwarfism. As the name suggests, this condition occurs when the pituitary gland doesn’t produce enough growth hormones. The dog ends up being smaller than its littermates and can also have a number of other health issues related to insufficient hormone production. Hip and Elbow Dysplasia must also be considered and tested for in the parents. Dysplasia is a condition where the joint does not form properly. This is more common in large breed dogs and can only be corrected by surgery. Socializing your Saarloos Wolfdog puppy early helps combat its fear of strangers. It’s essential for this pet. The same holds true for other family pets, since this dog has retained a strong prey drive. For this reason, if you have babies or vulnerable family pets you may want to adopt this breed as a puppy, rather than an adult. They need to be trained using positive reinforcement techniques. All things considered, the ideal home for a Saarloos Wolfdog is one where the handler/carer is experienced in dog ownership. These dogs need a lot from their owners, including attention, exercise, and playtime. The Saarloos Wolfdog is best placed in an active home environment with plenty of opportunities for canine-human activities. This is a dog that will thrive with some type of daily regular “work” to do. Are Saarloos Wolfdogs Good Family Dogs? The jury is split on this particular issue, but generally speaking, the Saarloos Wolfdog is not always the best pick for a family dog if your family has babies or other family pets. In addition to the reasons we listed above, this dog requires a LOT of hands-on training and attention, leaving less time for other pets, children, and partners. Saarloos Wolfdog breeders are a small and specialized group. For this reason, Saarloos Wolfdog puppies may not always be easy to come by, especially in the United States where the breed is less well-established. A certain amount of today’s demand is thought to stem from the popularity of the hit television program “Game of Thrones” and the direwolves it features. But this is NOT a good reason to buy a Saarloos Wolfdog! It cannot be stressed enough that these dogs are not ideal for new dog owners, and should only be considered by experienced canine handlers. The average Saarloos Wolfdog tends to start around $1,000 and can go up from there depending on the breeder’s show awards, as well as puppy gender, birth order, color, and other individual features. Should I Get a Saarloos Wolfdog? We hope the information you have just read through here will help you to answer this deeply personal question for yourself! What do you think? Is a Saarloos Wolfdog the right dog breed choice for your next canine companion? Let us know your thoughts in the comments section here! Jones, R., “Saarloos Wolfdogs,” Accalia Saarloos Wolfdogs Breeder, 2018. History of the Saarloos Wolfdog,” UK Saarloos Wolfdog Club, 2018. Serpell, J., “Cross-Breed to Avoid Inbreeding,” New York Times, 2013. FKC, “Instructions for Implementing and Monitoring Crosses Between Dogs,” Finnish Kennel Club Board, 2013. Oskin, B., “Ancient Wolf DNA Could Solve Dog Origin Mystery,” Live Science, 2015. GSDCA, The German Shepherd Dog Club of America, 2018. Bradshaw, J., “Saarloos Temperament and Health,” Miyax Dogs Breeder, 2017.